The barrel is one of the few components that directly affect the accuracy and weight of your build. Designed for corrosion resistance, this barrel will not let you down. This barrel is machined from 4150 Chrome Moly Steel, heat treated to RC 28-32 hardness, and properly stress relieved. This barrel has a nitride finish for increased strength and durability. It is chambered 7.62x39 chamber, with a 1:10 twist rate. This is the perfect barrel for an AR9 build, keeping weight to an absolute minimum, while still offering a significant ballistic advantage. There is nothing more crucial to the performance of your AR-15 than the bolt carrier group. Made to MIL-SPEC and finished with superior quality nitride finish that protects against corrosion and heat, our BCG won’t let you down. 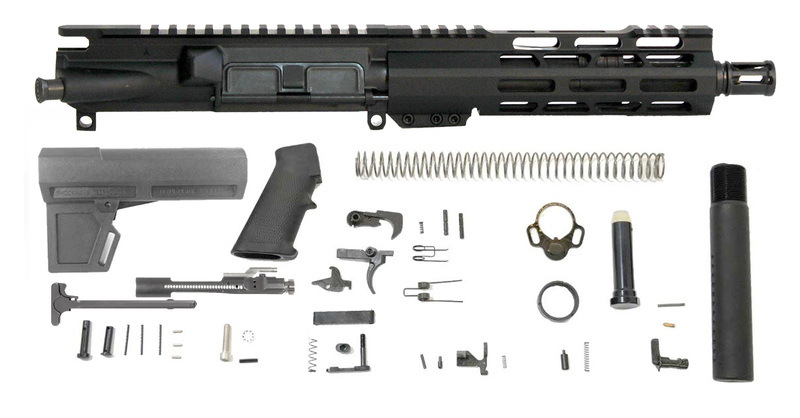 In order to ensure that it will run beautifully in your AR-15, each bolt carrier group undergoes high-pressure testing (HPT), and magnetic particle inspection (MPI). Whether you’re looking for a drop-in Mil-Spec quality replacement for your current AR or are going for a new build, this bolt carrier group provides you with the reliability and performance you expect from a first-rate product.